Migraines often run in families, and although studies have implicated three particular genes in more severe, but uncommon, familial and sporadic forms of migraine, the genetic basis for the most types of migraine that run in families isn’t understood. Scientists in Finland and the U.S now report on an analysis of data from more than 1500 migraine-suffering families, which suggests that an accumulation of many common gene variants, each of which wouldn’t on its own have a major effect, is more likely to underpin any genetic basis of the majority of cases of familial migraine than individual genes. Migraine affects an estimated 15% to 20% of the adult population in developed countries, and is an example of a common disease that can aggregate in families, the researchers explain. Migraine can be classified into different types, according to the type and severity of symptoms. 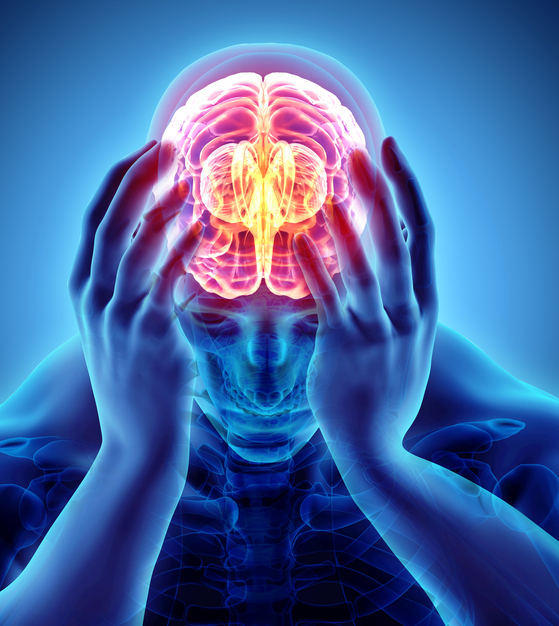 Rare forms of the disorder, known as hemiplegic migraine (HM) may be associated with stroke-like symptoms and can be either familial (FHM) or occur sporadically (SHM). More common forms of migraine can occur either with or without an aura and can also be familial or occur sporadically. Linkage studies have implicated a role for mutations in three ion transporter genes, CAC-NA1A, ATP1A2, and SCN1A, in some FHM and SHM cases, suggesting a Mendelian inheritance pattern. However, as the authors point out, “mutations in these genes explain only a fraction of FHM/SHM cases, and none of the more common forms.” And while linkage studies have associated more common forms of migraine with a number of migraine-related loci, they haven’t identified any specific genes. To investigate this further, the researchers first used data from recent migraine GWAS to construct a polygenic risk score (PRS) as an estimate of the genetic burden of common variants. Hundreds, and possibly thousands, of loci linked to migraines were incorporated into the PRS. They then used the PRS to evaluate the relative contribution of common polygenic and rare gene variations to familial migraine in a migraine family cohort comprising some 1589 families, including 8319 individuals, included in the Finnish FINRISK population database. Interestingly, there was a higher polygenic burden in familial cases of migraine that started at an earlier age. “This association was observed for all migraine types and is consistent with similar findings in other complex disorders,” the authors add. The association held true for all migraine types, and is consistent with prior observations that individuals who start to experience migraines before the age of 15 to 20 years have a higher genetic burden than migraines that start later in life, where there may also be some environmental or health role. In contrast, the three Mendelian genes that have previously been linked with HM appeared to have far less influence on familial migraine than might have been expected. Sequencing studies indicated that these gene variants may only be implicated in four of the 45 families affected by this form of the disorder. “We identified only four out of 45 sequenced FHM families (8.9%) with cases that carried one of these variants,” the researchers state. “This really shows, in a very big sample set, that common variants are very important factors in aggregation of migraines in the family,” Dr. Palotie comments. The team notes that their findings are in agreement with emerging evidence relating to the genetic basis of familial forms of other diseases, potentially including familial forms of dyslipidemia and Alzheimer’s disease, which had previously been thought to be explained primarily by rare variants. The authors suggest that their findings may thus have implications for other complex traits and for future therapeutic avenues, Dr. Paloti suggests. “This is of special interest for drug development.” Evaluating how genes impact on biological pathways that cause migraine symptoms may enable the development of more targeted drugs for migraine therapy.